HAMPI, INDIA - 28 JANUARY 2015: People boarding the boat on the Tungabhadra river. 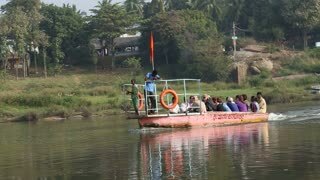 HAMPI, INDIA - 28 JANUARY 2015: Driving boat with pilgrims on the Tungabhadra river. 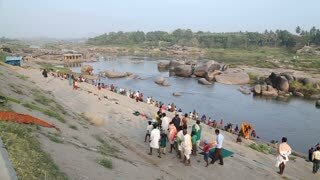 View of the Tungabhadra river in Hampi. 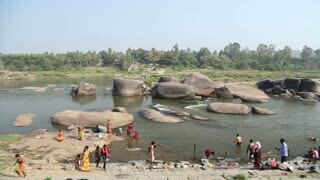 Drone footage of the countryside near Hampi, Karnataka, India, with the rocky granite boulders landscape with rices fields along the Tungabhadra river. The camera is facing down at the rocky landscape and is going along it. 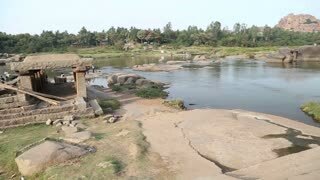 Drone footage of the countryside near Hampi, Karnataka, India, with the rocky bed of the Tungabhadra river and the granite like boulders forming hills in the background. The camera is going sideway along the river bed. 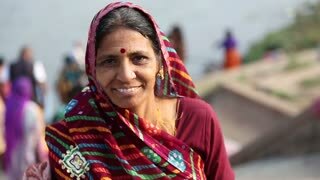 Drone footage of the countryside near Hampi, Karnataka, India, with its granite like boulders forming hills and the rocky landscape with rices fields along the Tungabhadra river. The camera is going sideway along the river. Drone footage of the countryside near Hampi, Karnataka, India, with the Tungabhadra river almost covered in green algae and granite like boulders forming hills along it. The camera is going over the river bed towards the rocky hill. 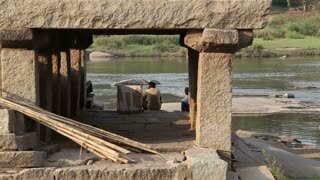 Drone footage of the countryside near Hampi, Karnataka, India, with the rocky bed of the Tungabhadra river, the granite like boulders forming hills and young rice fields along it. The camera is facing down at the fields and is going along the river. Beautiful sunset at Tungabhadra Water Reservoir dam near Hampi, Karnataka, India. Sunset reflection in water at tungabhadra water reservoir near Hospet, Karnataka, India. HAMPI, INDIA - 28 JANUARY 2015: People getting off the boat on the Tungabhadra river.